Anyone reading my blog should remember the two previous Lyons Tea campaigns that I've written about. Well I'm delighted to say that the latest in the series of Master Teablender ads is right on the ball, and continues this great campaign. The latest advertising campaign reveals that a ‘richer talk’ added to the tea is what gives Lyons Gold Blend its richer, full bodied taste. The new campaign launched on television screens this week bringing to life those richer, more colourful conversations, where what begins as a casual chat, delivers more than expected. The campaign has been developed by Rothco with this 30 second instalment directed by JJ Keith, produced by H2 Films and post-produced by Windmill Lane Studios. The campaign also comprises of one radio execution, and outdoor advertising on 48-sheet and 6-sheets, which will roll out next Monday (31st January 2011). The TV advertisement opens on the magical Lyons tea factory and the Master Blender and his young apprentice. The apprentice quizzes the Master Blender on why Lyons Gold Blend is so special, who replies, “It’s richer. Richer taste.” We see the rows of different boxes each with a different type of Gold Blend talk and the Master Blender continues, “So we put in richer talk… which leads to…. Richer STORIES.” The two then enter the Blending Room where we see the Master Blender adding the richer talk to the tea, creating Lyons Gold Blend. The ad then cuts to a family home with Dad, Mum and their 3 year old boy sitting on the couch. Mum and Dad are enjoying a cup of Lyons Gold Blend and Dad is recounting the age-old fairytale ‘there was an old woman who lived in a shoe’ to his son. Dad begins the tale, takes a sip of his Lyons Gold Blend and then continues with a somewhat embellished version of the story, “which if her taste was anything like your mother’s...it wouldn’t have been cheap….still at least she only had one shoe…not 50 pairs. The voiceover then reveals ‘A richer taste for richer talk’. Lyons Tea employs expert master blenders and tasters to select the best blends and combination of some of the finest teas from Kenya, Assam from India and Ceylon from Sri Lanka to produce the highest quality tea. 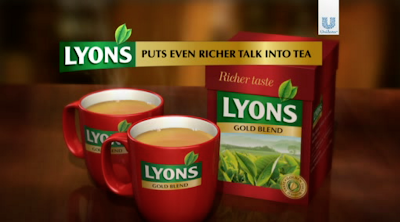 Lyons Tea is available from leading supermarkets and retailers nationwide. Lyons is Ireland’s number one tea brand with 42.8% market share***; Lyons is an iconic Irish brand with more than 100 years of tradition in Ireland, having started business in Dublin in 1902 near Christ Church Cathedral. It is now owned by Unilever Ireland. Lyons tea is currently working with the Rainforest Alliance - independent experts in sustainability and by 2012 all our tea will only come from Rainforest Alliance Certified™ farms.